International picture frames for your favorite images. Safari and island style. 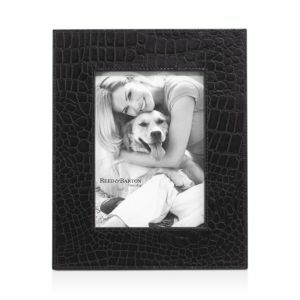 AERIN Classic Croc-Embossed Leather Frame Jan Barboglio Photo Box Pigeon and Poodle Corsica Mixed Marble Picture Frame, 5" x 7"
This stylish leather frame in a neutral shade is a versatile way to elevate larger photographs. Classic with a contemporary twist, it has been given an embossed crocodile skin-stylish finish. Wax cast box with frame top. Picture frame in marbleized lacquer. Nambe Hayden Picture Frame, 4" x 6"
The warm, rich tone of the Hayden Frame's border creates the perfect surround for a favorite picture, and the combination of wood and metal draws eyes in to highlight the photo. Set it on a side table or mantel to be admired Handpainted siras wood, brass, MDF, glass, iron The muted swirling pattern of this handcrafted frame complements your photos - while keeping the attention on your favorite memories. Handcrafted photo frame. 4" x 6" glass pane in handmade walnut base. Croc leather Handcrafted frames sold individually. Antiqued gold-tone metal. 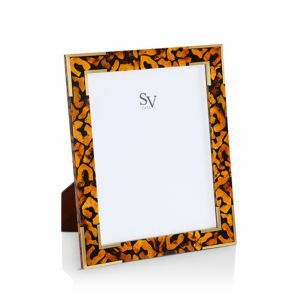 SV Casa Safari Picture Frame, 4" x 6" Pigeon and Poodle Eton Leather Picture Frame, 8" x 10"
This richly textured frame is inspired by a vintage compact case found at the London Silver Vaults, one of the world's largest silver markets. Inspired by Ralph Lauren's timeless leather accessories, the understated design of this frame emphasizes its finely grained calfskin and hand-stitched details. Inspired by Ralph Lauren's timeless leather accessories, the understated design of this frame emphasizes its finely grained calfskin and hand-stitched details. Inspired by Ralph Lauren collection from Spring 2017. Beautifully handcrafted leather frames trimmed with an elegant braid at the edges. Leather picture frame from the Ralph Lauren Home "Ryan" Collection. Handcrafted marble, wood, resin, and iron Pine wood, bone, iron Frame your favorite photo with this delicate, handmade piece. Enhance your photo display with this lovely wooden frame. Eucalyptus wood, resin, engineered hardwood, glass With bright hues, this handpainted piece adds richness and warmth to every framed photo. Westport Lacquered Eggshell Picture Frame, 5" x 7" Pigeon and Poodle Colmar Dark Blue Shell Picture Frame, 4" x 6"
Colmar Dark Blue Shell Picture Frame, 5" x 7" Bari Natural Clamstone Picture Frame, 4" x 6"
Picture frame made of lacquered eggshell. Frame made of deep blue pin shell. Picture frame in clamstone with brass border and lacquered wood back. Pigeon and Poodle Genova Natural Rope Picture Frame, 4" x 6"
Genova Natural Rope Picture Frame, 5" x 7"
Genova Natural Rope Picture Frame, 8" x 10" Hanging Pocket Frame Pigeon and Poodle Grasse Natural Cane Picture Frame, 5" x 7"
Grasse Natural Cane Picture Frame, 4" x 6"
Picture frame made of natural rope. This clever handmade piece can be used to display a favorite photo and store important keepsakes in one place. Wide-border picture frame made of natural woven cane. Frame made of cast metal. Hand enameled and hand set with Swarovski® crystals. Handcrafted frame made of cast metal. 14-kt. gold plating. Hand enameled and hand set with Swarovski® crystals. Handcrafted Jay Strongwater frame. 2.75"Sq. ; holds 2"Sq. photo. Hand-enameled cast pewter. Hand-applied 14-karat gold detail with antiqued touches. Hand-set Swarovski® crystals. Brass frame in golden. Cast aluminum, engineered hardwood, glass Frame made of nickel-plate and washed enamel. Pigeon and Poodle Oxford Faux-Shagreen Picture Frame, 8" x 10"
Oxford Faux-Shagreen Picture Frame, 4" x 6" Bressa Picture Frame, 5" x 7"
Bressa Picture Frame, 4" x 6" Oxford Realistic Faux-Shagreen Picture Frame, 4" x 6"
Picture frame made of faux shagreen. Picture frame in speckled, water-sanded lacquer. 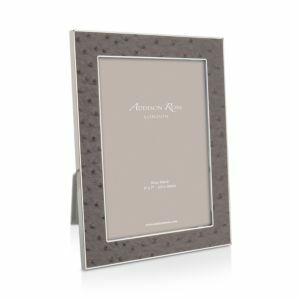 Picture frame made of realistic faux shagreen. Handcrafted frame. Natural and oxidized bronze and nickel-plated metal. Composed of lustrous silver plate and shimmering mother of pearl, these Martha Stewart Collection picture frames lend opulent grace to beautiful memories. Handcrafted frame. Natural and oxidized bronze. Stone and wood layered photo frame. Metal inset trim in brushed brass finish. Frame designed by Sean O'Hara. Chrome-plated metal and glass. Frame designed by Scott and Torrie Morrison. Silver-plated metal and glass.